When the "Texas" Infantry re-entered the line on November 15 in the Mignano - San Pietro sector, it rained daily for seventeen consecutive days. Cold winter rains brought maddening bodily discomfort. The earth turned to mud. 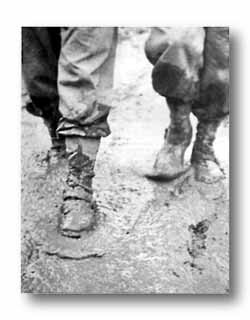 Flooded bivouacs, slithery roads and trails, often under enemy observation, greatly slowed all operations. Truck convoys struggled over just such roads. 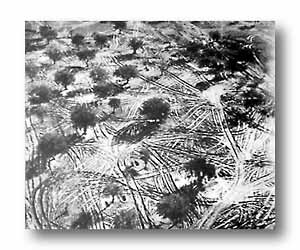 The novel pattern of the olive orchard below was an artillery bivouac just back of the line near Venafro. ABOVE, TRACKS OF VEHICLES ETCHED DEEP IN MUD PRESENT A DIZZYING PATTERN. THIS WAS A FIELD ARTILLERY BIVOUAC. BELOW, QUAGMIRE SERVED AS ROAD TO BYPASS BLOWN BRIDGE. SLOG, SLOP, SLOG! ITALY WAS NO LAND OF SUNSHINE TO HAPLESS GIs. Long periods of rain turned the battlefield into an endless sea of mud. For the infantry it meant not only fighting up slippery trails, but also living in fox-holes which had been turned into ponds. 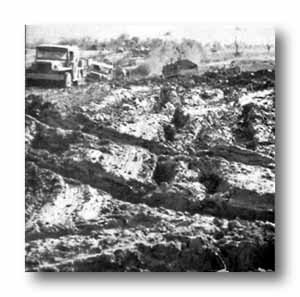 Behind the front, truck convoys wallowed and stalled in axle-deep mud along secondary roads, or while bypassing enemy blown installations along the main routes. Even the versatile jeep found itself helpless when it became embedded in the quagmire. 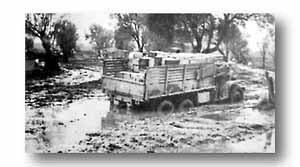 A DIVISION RATION TRUCK BOGGED IN FLOODED BIVOUAC. PUPTENTS PROVIDED LITTLE PROTECTION WHEN IT RAINED.